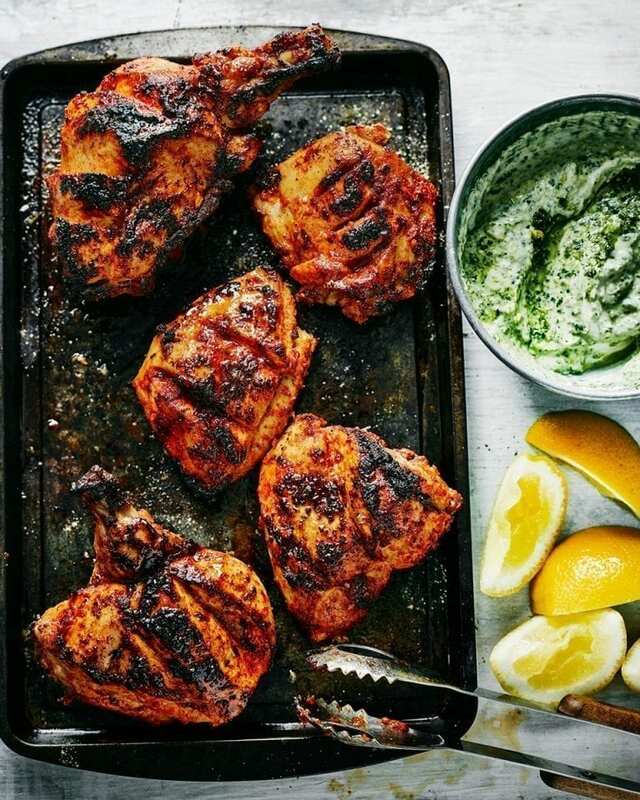 Anjum Anand’s Tandoori-style chicken recipe is incredibly easy to make and even easier to devour. The only trick is to ensure you marinate the chicken for a few hours at the very least. This flavoursome recipe is great for barbecues. Slash each piece of chicken 3 times down to the bone at the thickest parts of the flesh. Place in a bowl and marinate in about half the lemon juice and half the salt for 30 minutes if possible. Blend together all the ingredients for the marinade (except the lemon wedges) until smooth (add the extra lemon and salt if you didn’t marinate it as above). Add to the chicken and leave to marinate for as long as possible – preferably overnight, covered in the fridge – but at least for 3–4 hours. Remove the chicken from the fridge 30 minutes or so before cooking. Preheat the barbecue to a medium-high heat, or preheat your oven grill to a fan-assisted high setting and line a baking sheet with foil. Place the chicken on the barbecue and cook, turning often and moving around to prevent burning and hot spots, until charred and cooked through, 20–22 minutes, turning often. Or place the chicken on the prepared baking sheet under the grill, and grill until charred on both sides and cooked through; it should take the same amount of time. If it is cooked but not very brown, move closer to the grill bars for a few minutes at the end of cooking time. To make the chutney blend everything together until smooth, then taste and adjust the seasoning. Baste with the butter – mixed with the paprika or Kashmiri chilli powder, if you like – sprinkle over the chaat masala and ground fenugreek, and serve with lemon wedges and the yogurt chutney. Recipe from I Love India by Anjum Anand (Quadrille £20). Photography by Martin Poole.